At lunchtime today, Alexis Downe, lecturer in Toulouse University 1 Capitole and visiting lecturer here in Trinity, gave a staff seminar on “The reform of French Contract Law: a brief overview”. 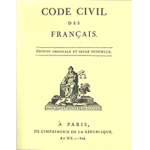 The fundamentals of French private law in general, and of the Law of Contract in particular, are largely unchanged in the Code civil (first edition cover pictured left) since it was adopted in 1804. Nevertheless, there have been significant social changes, from the nineteenth century’s industrial revolution, to the twentieth century’s two world wars, to the twenty-first century’s information age. In many ways, the current process of reform is intended to allow French contract law to catch up with these and other developments. In this post, I provide some background to the current process of reform of French contract law, and then discuss Alexis’s paper. After considerable debate … the Government was granted the authority to proceed. The draft law (in the form of an Ordonnance) concerning contract and obligations in general was published in February of 2015 so as to allow a brief period of consultation: the draft text can be seen here, and further information is available here. …. Alexis explained that the objectives of the reform process are threefold. First, simplification: the aim is to simplify the law of contract, to make it more accessible and intelligible, including by the incorporation of judicial decisions. This is a laudable aim, but too much is often made of it. Because lawyers typically study contract law early in their studies, and because we all have regular engagements with contracts, there is a sense that contract law should be basic not only in the sense of fundamental but also in the sense of rudimentary. But this is a misconception. The law of contract covers a great deal of ground, much of which is complex in theory or problematic in practice. We should not therefore demand too great a simplification – there is only so far it can go before it becomes simplistic. Second, the protection of weaker party. This involves a conceptual shift from the 1804 assumption of equality of bargaining power to a modern recognition of inequality of bargaining power. This, too, is a laudable aim; but this shift must not be pushed too far. Contract law has never had either “a complete descriptive theory, explaining what the law is, … [or] a complete normative theory, explaining what the law should be” (Schwartz & Scott; see generally Treblicock). And third, attractiveness: this aim is to make French law attractive in various contexts, as a choice of law for contracting parties, as a precedent for those choosing to reform their own law (eg, Morocco), and as an influence on the EU acquis on Private Law. This must, in part, be a response to the wholesale Dutch move from the French orbit to the German in their 1992 reforms to the Burgerlijk Wetboek. It is certainly the most political of these three main justifications for the reform process. Alexis’s main concern was whether four centrepiece reforms worked in their own terms and respected these three aims. First, he considered the proposed abolition of “cause”, and the relocation of its functions to other elements of the Code civil, and he argued that it fulfilled all three aims. Second, since l’arrêt de la Cour de Cassation du 6 mars 1876, Canal de Craponne, French law has traditionally held that an unforeseen event do not relieve parties from their contractual obligations; but this rejection of a doctrine of “imprévision” has recently been derogated somewhat, based on bonne foi and cause. The current reform proposes that, where there are (i) unforeseen circumstances, which (ii) make performance excessively more onerous, (iii) for a party who has not accepted the risks of those circumstances, then that party can seek to renegotiate the contract, and if that renegotiation fails, then the party can apply to court to discharge the contract. Alexis felt that this failed all three of the stated aims of the reform; far from simplifying the law, it made it more unclear, complex, and unpredictable; it did not favour the weaker party; and it would be unlikely that international parties would submit to a system with this unpredictability. Third, he looked at the proposals to reform the law on unfair contract terms, which he said have been very heavily criticised by French scholars. There are already rules relating to unfair contract terms in the Consumer Code and Commercial Code, and it is proposed to add a third strand of rules in a new art 1169 of the Code civil. 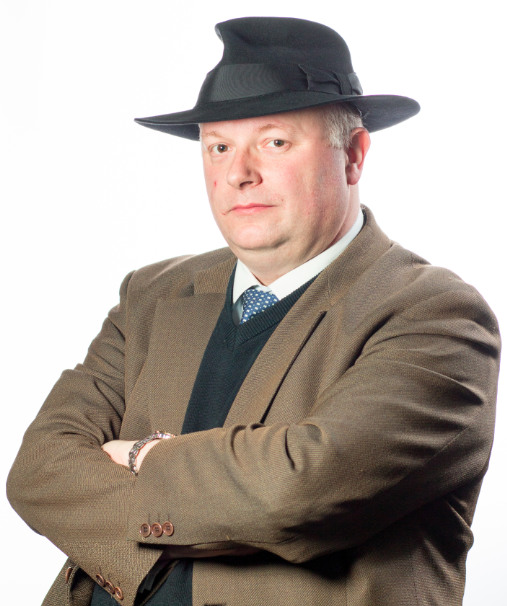 These new rule would be wide ranging, not just confined to boiler-plate standard form contracts but applicable to every contract, and not just confined to consumer contracts, or to black and grey lists of unfair or potentially unfair contract terms, but applicable to all contracts with a significant imbalance between the parties. He compared and contrasted the Consumer Code and Commercial Code provisions with the Code civil proposals, and concluded that, since there are differences in scope and sanction, so their inter-action will be problematic. It used to be, he said, that the civil code drove consumer law, now it seems to be the other way around. Forth, he looked at changes to the rules relating to enforcing performance in kind. In French law, this is a subjective right of the parties, not subject to judicial discretion or subordinate to damages as specific performance is at Common law. Until now, there were only two limits to the right to enforce performance in kind: physical impossibility, or moral impossibility. Article 1221 will introduce a new limit on enforcing performance in kind where performance is impossible or its cost is manifestly unreasonable. This is broadly in line with the limited acceptance of a doctrine of imprévision, and these developments together reflect the influence of the Draft Common Frame of Reference (pdf). If so, then it stands as a good example of what might be termed the soft harmonization of civil law in EU member states [by contrast with “hard” harmonisation achieved by mandatory EU legal instrument]. However, all of this comes at the price of uncertainty. Of course, all reform has that price. And even though the three intended aims of the reform process are not really advanced by this reform, it does not seem to me that the price of uncertainty is too high in this case. In his conclusion, Alexis was very much in favour of the reforms, but he counselled against being too enthusiastic. Taken in the round, he argued that these four reforms will protect weaker party, but at the cost of a great deal of uncertainty, which could make the system less attractive. Furthermore, they will entail the loss of much of what makes French contract law quintessentially French, and thus different from other systems. Moreover, other things than the law of contract make legal systems attractive, such as legal and social stability, other legal rules such as labour law and tax, and so on. He concluded that too much must not be claimed for the reforms, but if and when they come into force next year, they will be very welcome.